The KD420 is a high speed Modbus sensor interface which allows any 4-20mA or voltage output sensor to appear as a Modbus RTU Slave on an RS485 multidrop bus. The KD420 can also act as a Modbus RTU Master and write the data into a Modbus RTU Slave over 2-wire RS485, using a separate RS485 interface. The KD420 works straight out of the box but can be reconfigured using either a supplied Windows configuration program (via a suitable RS422 or RS485 interface) or by writing values to special Modbus registers. Baud rates from 30 to 115200 baud are supported and up to 200 readings per second can be achieved. Accuracy is specified at 1% over the entire operating temperature range of -25C to +70C. Resolution is 0.03%. Industrial use is facilitated by configurable filtering over the 50Hz or 60Hz mains cycle period for maximum mains noise rejection. The KD420 supports high speed data acquisition. Up to 220 readings per second are possible. The KD420 is powered from 11 to 35V DC, or 24V DC if its 20V sensor power output is required. The Modbus comms interface, the analog sensor interface, and the power input are all mutually isolated and 100% tested at 1500V AC. 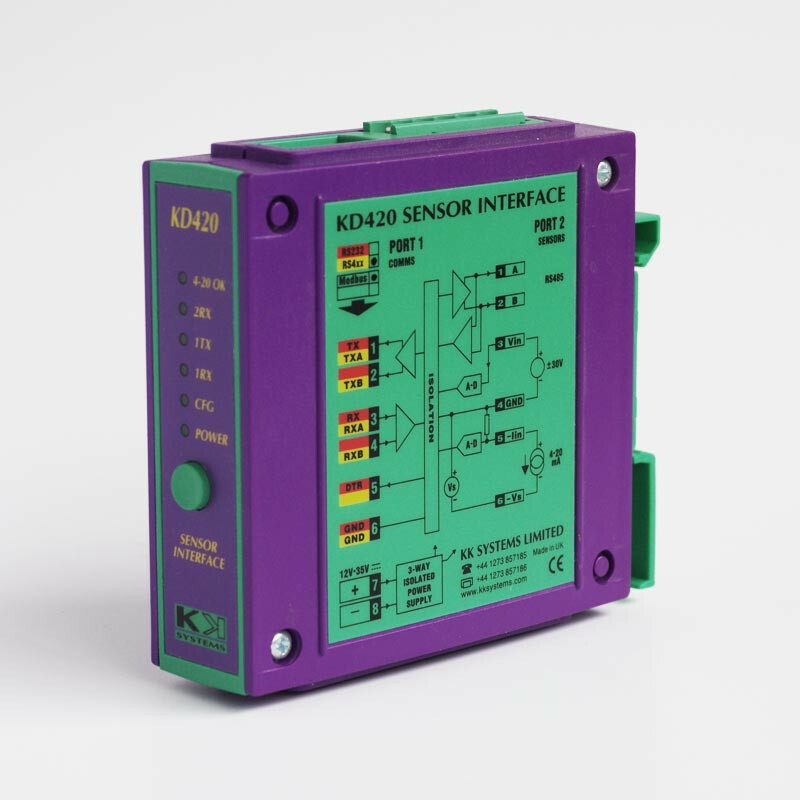 The KD420 provides a simple and inexpensive means of interfacing a variety of sensors (for example PT100 temperature, flow or pressure sensors) to an existing SCADA or telemetry system.